Since its inception, there have been a myriad of complaints levied against Apple's new Maps app. 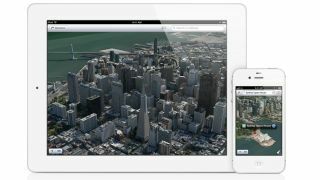 Included in iOS 6 as a replacement for Google's Maps, Apple's version has come under scrutiny for having outdated information, blurry images, and lacking public transportation information. Apple's Maps has also come under fire for including high-quality images of secure facilities around the globe. Locations like a Turkish maximum security prison, as well as a military airstrip on the Japanese island of Minamitorishima, and the United States' Aberdeen Proving Ground in Maryland can be seen clearly in Maps. Taiwan can now add one of its prized secure military installations to that growing list, and the government isn't very pleased. The Taiwan Defense Ministry reached out to Apple to have the images of its new $1.4 billion (UK£875 million, AU$1.3 billion) early-warning radar facility in Hsinchu blurred out. Even if just 4 percent of iOS 6 users use Maps, that's clearly too many sets of eyes able to view the vital Taiwanese installation. In fact, Ministry spokesperson David Lo told the Associated Press, "Apple should follow its rival Google in using only low-resolution satellite pictures." Google has made a practice of blurring out images of such high-security locations, and has even been known to do so upon request. The radar station is set to go online later this year, and oddly enough, reports indicate Apple's imagery of the base is a year old. Even with outdated cartography, Apple just can't seem catch a break when it comes to Maps.